At The Tasty Ski Company we love simple delicious flavours. We don’t know many people who are not big fans of banoffee pie, it’s a classic comfort pudding that always goes down a treat. 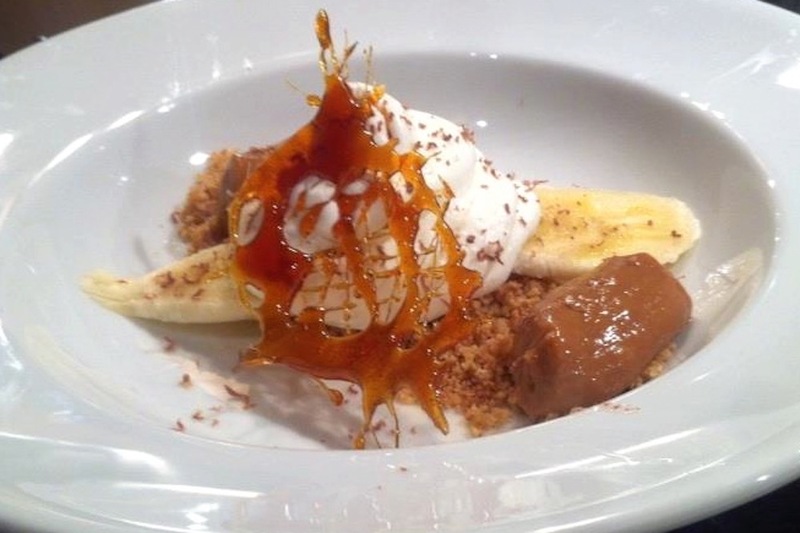 However we also love beautifully presented dishes so our banoffee pie has undergone a slight face lift. This is Morzine Chef Phil’s recipe and it has been a huge success, and is definitely going to stay on the menu for winter 2014/15. Add the tin of condensed milk (unopened) to a pan of water. Bring to the boil and simmer for 3 hours until the milk has reduced by half. Place the digestive biscuits in between cling film and bash up with a rolling pin until it is very crumbly. Melt the butter in pan, add the biscuits and combine, then remove from the pan and reserve until ready to serve. Add the sugar to a pan on a medium heat and continue to stir with a heat proof spatula until it caramelises. Let cool down slightly then take a spoon and drizzle the melted sugar onto some grease proof paper. Reserve until ready to serve. When ready to serve, slice the bananas and whip up the cream to soft peaks. Decorate artfully on the plate and finish with some grated chocolate.